Late last year, I was offered the chance to join a group of authors as each one put one or more of their bundles on sale. Except I didn’t have a bundle, so I had to take one of my series and MAKE one. Quick. 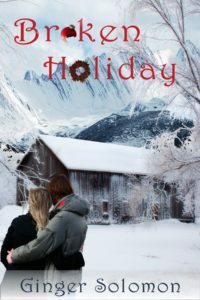 I chose my Broken Holidays Series (three novellas, all stand-alones set in the same location). I also needed to create a bundle cover. This was something I hadn’t done before. I thought about the characters in my series, and none of them looked alike. I’m one of those strange folks who actually like the cover models to look like the characters. So I decided to go with a couple holding hands. But what about the original covers? They were not very professional looking. Truthfully, they were my first self-made covers and I didn’t know much, but I did know I couldn’t afford to pay someone. I did the best I could. I looked at them and decided they needed updates. So here’s the old to new covers for Broken Holiday, the first book in the series. I wanted to make sure they looked more like contemporary christian romance and less like women’s fiction. And then I asked for advice on one of the FB groups I’m in. Many said the “new” couple has been used too many times on the covers of books–back to the drawing board, er, the photo site. And so, I did more searching and more searching. I worked and worked. I got this post in late because I couldn’t quite get satisfied with my attempts. I’m still not, and I’m only on cover ONE. My goal for this post was to show you all three new covers, but alas, I fear that is not to be. Here’s the current cover in progress. Oh, wait, did I mention that they thought my title didn’t meld well with my smiling couple? Because the people giving the advice are indie writers like me, and I value their opinions. And if you’ll notice, I left the broken ornament in the title. I think with the white background, it’s easy enough to read and understand. I’m debating about the wreath for the “o” in Holiday. 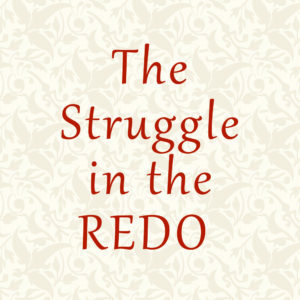 So there it is … the struggle in the redo. So when you see that an author has given their covers a face lift, realize that it’s sometimes a LONG process before you get to see the end results, at least if they create the covers themselves. And sometimes if they hired it done. If you have the original three, then you’re good. There is no new content. I’d rather you spent your money on books you haven’t read (or something new that I bring out this year, LOL). Hi Ginger! Best wishes as you diligently rework your stories and covers. So many elements to consider. Have a great weekend. Thanks, Renate. Yes, there are. Sometimes I forget that when I’m READING. I didn’t realize how many different decisions an author has to make. I just love reading. You are progressing nicely so stay positive as you work on your new covers. Thanks, Bernice. I think with all things, there are many facets that we never see. I also am in the middle of re-branding my contemporary romance series (but I’ve been advised to market them more as women’s fiction). ;) I don’t know how many iterations I’ve tried, with several polls. I’ve tried five different pictures, with at least five possibilities of each, some with the title on the top, the title on the bottom, the picture on the left, the picture on the right, many different filters, borders, no border, different fonts, different text colors, author name smaller, author name bigger, etc. I’m working on something different with the titling, so we’ll see if it works. I’ll repost the covers when I get them finally finalized. Haha … Thanks, Margaret. Your encouragement is enough. Thank you, Paula Marie. Peace is exactly what I need. When I have that then I’ll know I’m on the right track.